Explanation: Sometimes, after your eyes adapt to the dark, a spectacular sky appears. Such was the case earlier this month over Ontario, Canada, when part of a spectacular sky also became visible in a reflection off a lake. To start, the brightest objects visible are bright stars and the planet Jupiter, seen as the brightest spot on the upper left. A distant town appears as a diffuse glow over the horizon. More faint still, the disk of the Milky Way Galaxy becomes apparent as a dramatic diffuse band across the sky that seems to crash into the horizon far in the distance. In the foreground, a picturesque landscape includes trees, a lake, and a stone wall. Finally, on this serene night in July when the lake water was unusually calm, reflections appear. 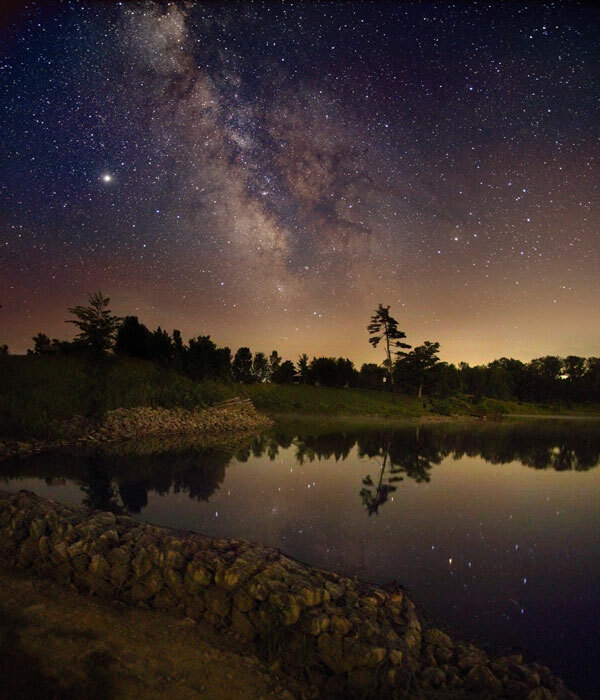 Visible in the lake are not only reflections of several bright stars, but part of the Milky Way band itself. Careful inspection of the image will reveal, however, that bright stars leave small trails in the lake reflections that do not appear in the sky above. The reason for this is because the above image is actually a digital composite of time-consecutive exposures from the same camera. In the first set of exposures, sky images were co-added with slight rotations to keep the stars in one place.